A new model from Dufour Yachts redefines the term racer-cruiser with excellent performance and a clever, feature-packed interior. 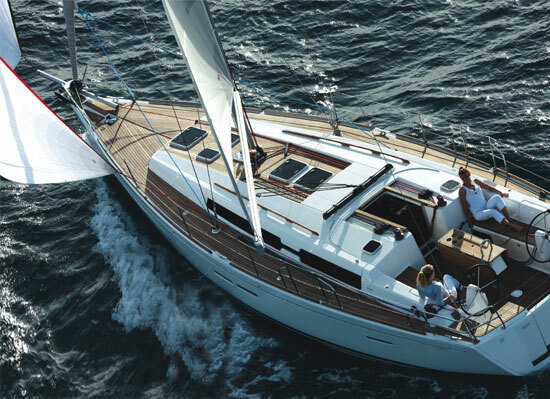 Europeans and Americans look at things a bit differently, which explains why German writer Michael Good never used the term “racer-cruiser” when reviewing the new Dufour 36p (Dufour 36: Bold New Lines). And here in the US of A, the mere mention of the term racer-cruiser is likely to elicit a smirk followed closely by an eye-roll. Many production boat manufacturers have been a bit loose with this moniker and the result has often been criticized for being neither a cruiser nor a particularly fast racer. But Dufour’s new 36 Performance model might just be the boat that brings credibility back to that term. Fast, responsive, and easy-to-sail, the new design walks the fine line between summertime beer can races and long weekends cruising in comfort—something that both Americans and Euro-sailors can appreciate alike. 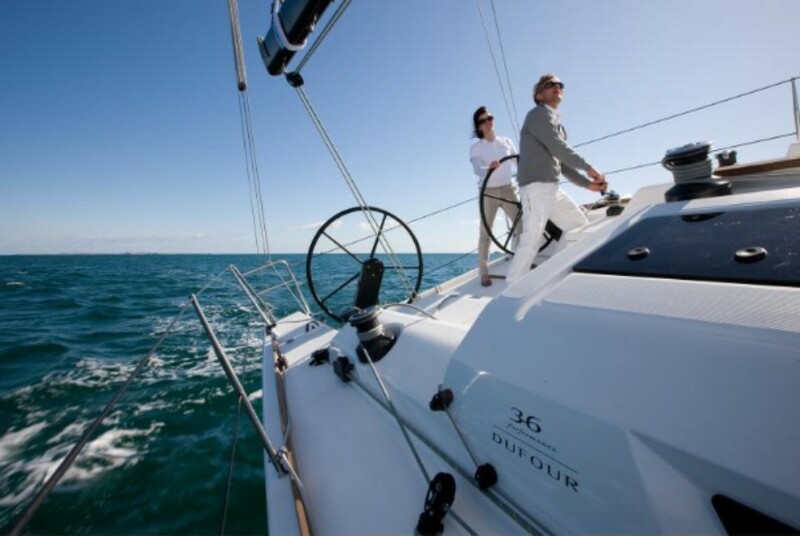 The Dufour 36 adds new credence to the term "racer-cruiser" among modern production sailboats. The 36p’s construction is a standard vacuum-bagged hull, solid below the waterline and cored above. There is a molded grid glassed inside the hull to add stiffness and the deck is foam-cored as well. Extra care was taken to keep the boat light and therefore competitive, and evidence of this can been seen even inside, where some of the stowage compartments don’t have actual hatches but rather zip-out canvas enclosures. The plumb bow, wide aft section, and hard chine visible just above the waterline are a nod to the direction most production sailboats have taken in the past few years. The deck is uncluttered and the cabin top barely rises, giving the whole boat a sleek and fast-looking profile. 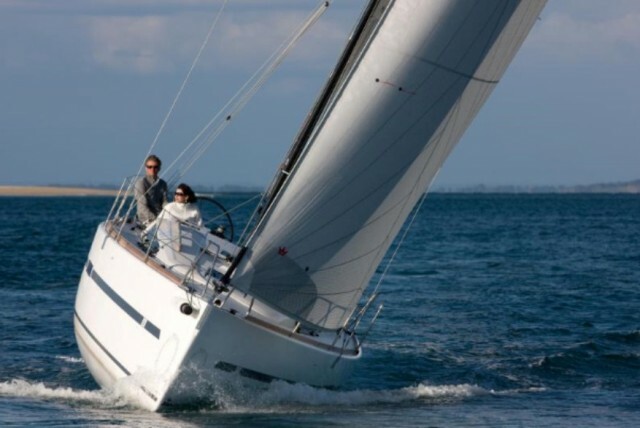 Below, the deep draft keel (7’ 2”) has an iron T-shaped bulb and a high aspect spade rudder, both of which help the boat maneuver well and turn practically within her own length. The 36p isn't just fast, it's sleek and good-looking, as well. The 7/8 fractional rig has a keel-stepped Sparcraft mast and aft-swept spreaders. 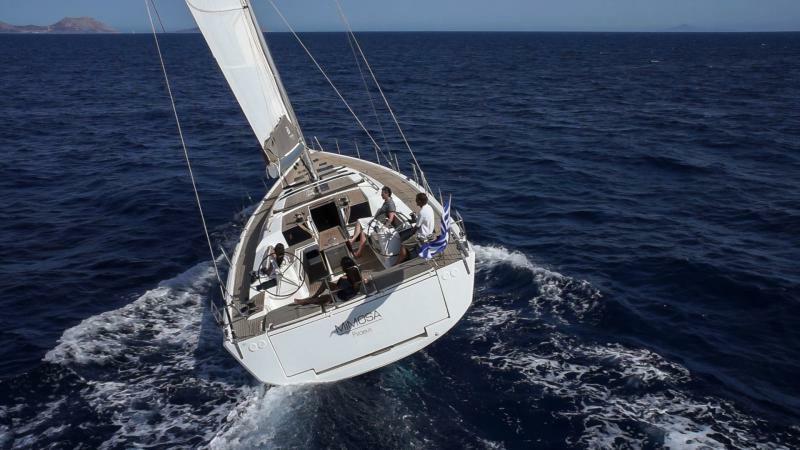 The standard configuration includes a traditional main and a 100- to 115-percent jib, although a track for a larger genoa is added. The twin helm wheels are nicely pushed outward so there's room to work when racing or walk through to the transom when cruising. The cockpit is notable for its clean and functional design. As I’ve mentioned, the wheels are aft and well outboard, which leaves room for a racing crew to work. The double-ended mainsheet is attached to a large traveler that’s built into and crosses the entire cockpit sole. 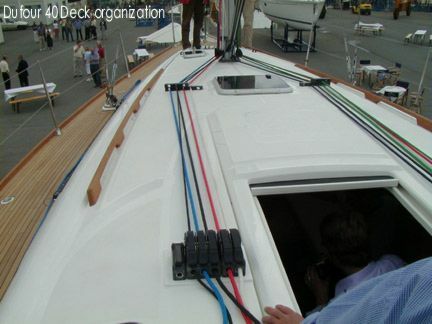 Seats on either side are fully self-contained and removable so jib trimmers can get close to the primary winches. When cruising, the benches, which are like small dock boxes, can be brought back on deck and re-secured. A centerline table is available as well. Six winches will take care of all the lines including a spinnaker and all are easily accessible, albeit not from the wheels. There are four hatches, two on either side of the companionway. They are flush which is nice but their placement will require a creative canvas professional to design a workable dodger or perhaps just a small spray hood. The transom and cockpit area is designed for both functionality, and cruising comfort. The transom is raised and lowered manually, which is not difficult because it’s cantilevered. With the transom down, you can see the built-in swim ladder and the cubby under the cockpit sole for a liferaft, which is ideally low and close to the water. There’s only one accommodation plan, which gives the boat a standard two-cabin, one-head layout. However, there are some clever features that make the boat somewhat “convertible” and definitely more comfortable even for a race crew. The forepeak cabin has a standard V-berth arrangement except that the bunk can be divided with a built-in board that cuts the berth in half, thereby providing room for two to sleep in relative privacy, or for crew on one side and sail stowage on the other. 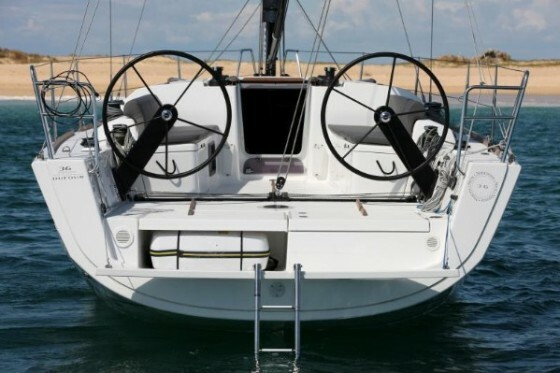 Another excellent idea is the double entry door that latches on to the mast when closed. It opens wide to join the forward cabin with the saloon. For cruising, this gives the boat a wide open feel. For racing, it will allow sails to be dragged forward easily. Aft in the saloon, two long (6’ 7”) straight settees flank a drop-leaf table that has a couple of creative aspects as well. The top has a removable panel that flips upside down. It’s wood on top and heat-resistant on the bottom, and when flipped, provides a convenient place to put a hot pot of food without worry about scorching the wood. The port side leaf is removable and can be moved lower to create a double bunk with just a few twists of a screw. The galley to port is L-shaped and compact but certainly efficient to put out hardy meals for a working crew. Included are twin sinks on the centerline, a top-loading fridge, a two-burner propane stove with its own cover, a removable tip-out drawer for flatware, and a small built-in wine and oil locker set into the counter. Lighting is a bit sparse both in the galley and the cabin directly aft. Stowage is light, as you may expect for a weekender or race boat, which is why the two bins under the sole are a good addition. Each of these compartments is finished in gelcoat and is waterproof so foodstuffs or even clothing can be stowed within. To starboard is a small head and shower combination—no separate stall shower, here. It does, however, have cavernous stowage behind the rear panel. This space is directly below the cockpit lazarette and can also be accessed from above. A surprising feature on a boat this size is the dedicated, forward-facing nav station to starboard. Overhead is a small locker that’s designed specifically to have a chartplotter mounted in the door so when it swings out, the plotter faces the person at the desk. The top of the desk doesn’t just open, but instead drops down and out of the way, so a laptop can be worked on and then easily covered again when not in use. Finally, the nav seat cants to compensate for heel with a manual pin. There are many smart ideas packed into a basic interior which will make life aboard infinitely easier for a weekend cruise or a day of buoy racing. The finish is well executed in Maobi wood laminate and white gelcoat surfaces, and plenty of light comes through six hatches, two opening ports and two fixed hull ports. Sail area 776 sq. ft. The 36p represents a new direction for this French company. 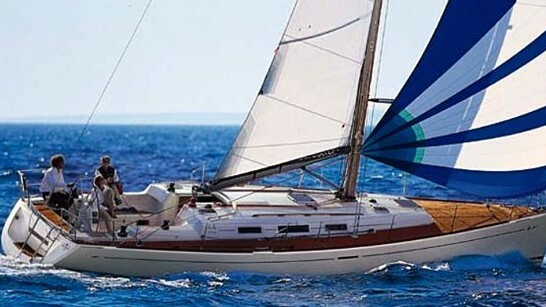 They already have their Grand Large cruiser line, with such highlights as the fast, well-made Dufour Grand Large 405. And going forward, this new 36-foot model may be overtaking their E-series performance designs. The company was purchased by German-owned Bavaria Yachts a few years ago and this is a great new effort at bringing the performance aspect back to a performance cruiser. 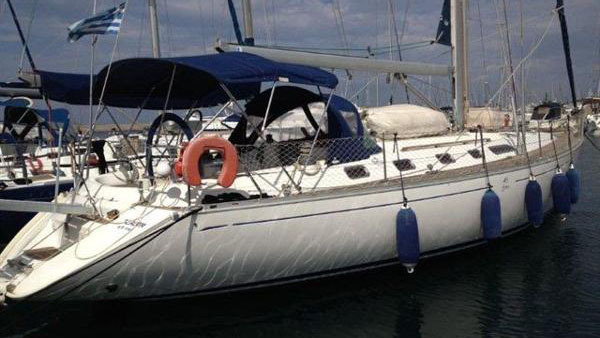 Whether the 36P is ever raced or not, she will provide her owner with hours of fun, hands-on, responsive sailing—leaving no room whatsoever for smirking when she is described as a racer-cruiser. 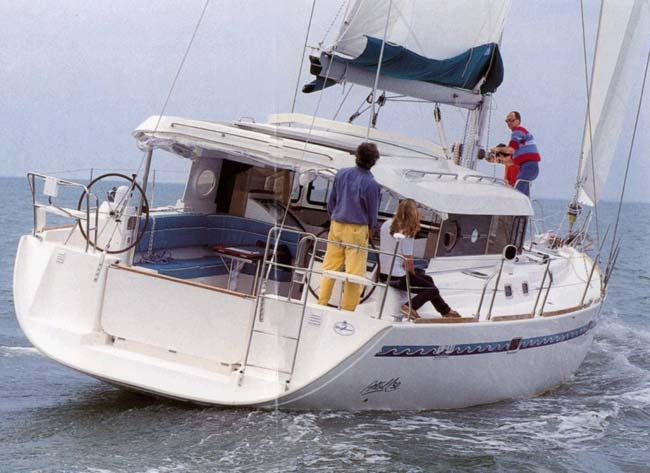 The slightly smaller Bavaria Cruiser 33 has a more traditional cockpit layout and rounder lines. 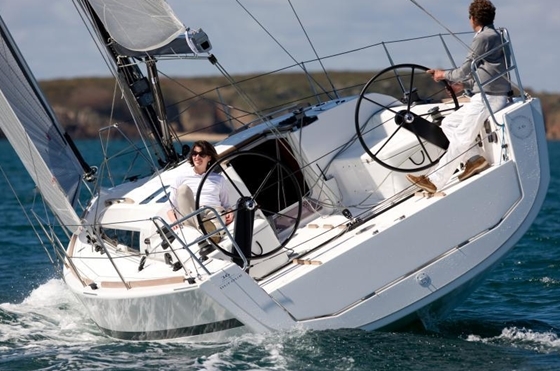 The slightly larger Hanse 385, on the other hand, maintains a sportier attitude without abandoning creature comforts. 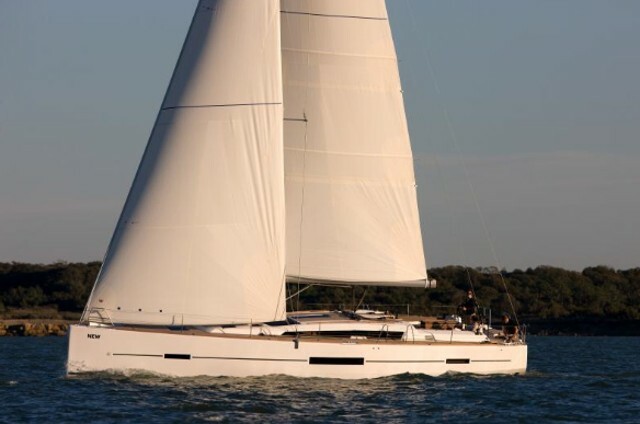 For more information, visit Dufour Yachts.